Students in an iPad classroom often perform research for essays and other assignments, so iPad apps that help students gather and organize information are essential. Other apps, such as a dictionary, are essential as well, if students need to turn their research into a written assignment. Needless to say, if you’re a teacher who does research as well, you’ll find some of these these apps essential for your own needs. iPad apps frequently come and go, especially the ones once thought “essential”. Look for an updated list on the iPads in Education website, where new and essential items are constantly added to the list of apps you might want to consider. No longer those thick volumes you used to pull off a shelf, today’s digital dictionaries provide access to millions of words and will even pronounce them for you. The app from Dictionary.com offers a complete English dictionary and thesaurus with more than two million definitions, synonyms, and antonyms. Everyone struggles with finding the right word. Older students may struggle with the words used in some of the literature they read for assignments, or with finding another word for the word they’ve used several times already in an essay. Younger students struggle with attempts to expand their vocabulary. 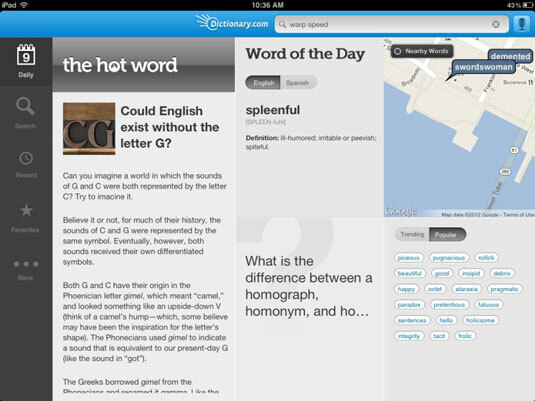 Dictionary.com iPad app is a great solution to offer them. This reference app gives you offline access so that you can access most of the content even when you don’t have an Internet connection. It uses the iPad’s microphone and audio by offering search by voice and audio pronunciation of words. Standard dictionary features are included, such as sample sentences, spelling alternatives, and word origins. Students can expand their vocabulary with the Word of the Day, and they can even shake their iPad to receive a random, surprise word at any time. Although it provides a great dictionary, the Dictionary.com app does tend to nag you with all sorts of unexpected in-app purchases for additional functionality. Essential? Maybe Pastefire isn’t one of those “I can’t live without it” apps, but this utility app is a real timesaver, and sometimes being very cool does count for something. So you found a really great website on your desktop but your iPad is at school. Sure, you could e-mail the address of the website and get it later on your iPad. Boring. Click the Pastefire icon on your browser, and the website address is sent immediately to your iPad or iPhone. What’s more, Pastefire doesn’t just copy content: It knows what to do with it. Pastefire knows it’s a web address, so it opens the site in your browser. That WWII map you really liked for the lecture tomorrow? Copy the image, and Pastefire puts it into your iPad’s photo gallery so you have it when you return to school tomorrow. Copy text, and Pastefire will automatically SMS or e-mail it. There’s so much information to read on the Internet that it’s a full-time job just trying to keep up. As a teacher, you probably run across pages and articles that you would like to read when you get the time. Wouldn’t it be great if you had an easy way to file and sort them? Older students are often given research assignments in which they must scour the Internet for viable sources and related, pertinent material. Gathering such information is often the first step in a long research project. Reviewing the information’s importance and cataloging it for a bibliography is typically step two. Pocket could be the solution to both your problems. 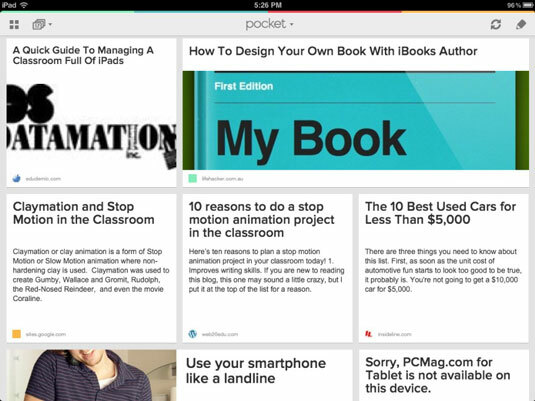 The latest release of Pocket has certainly put it at least on par with Instapaper in terms of functionality, and it’s extremely well designed and easy to use. Add a button to your browser toolbar, and whenever you find something on the web that you want to view later, tap the button, tag the content, and put it in Pocket. Pocket automatically syncs content to all your devices and computers so you can view the content you’ve saved any time and you can even read it without an Internet connection. Access your Pocket account directly over the web or through the various apps it offers for different mobile devices. The iPad app presents your content archive in a beautifully designed and easy-to-navigate visual grid. Tag and archive articles, videos, webpages, and more. 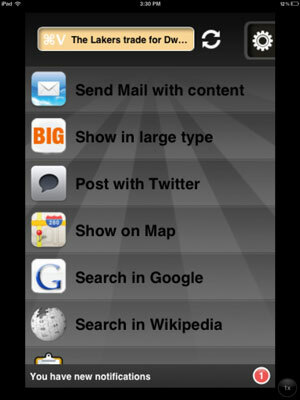 Pocket also works with hundreds of other apps so that you can easily pocket items referenced in apps such as Twitter and Flipboard. You also get a personal e-mail address for your Pocket account so that you can send content via e-mail. Google is the web tool that has become so ingrained in daily life experience that it’s actually become part of the language. Teachers (and well, everyone) no longer search for information on a topic they Google it. As an educator, you may often Google the latest information on a topic you’re about to teach, or the latest teaching techniques. Your students may use Google to locate additional information on a topic you’re covering, or a video you referenced on YouTube. For both of you, the Google Search app may be an ideal tool. The Google Search app is a reference app that gives you that same easy access to the information on the web. 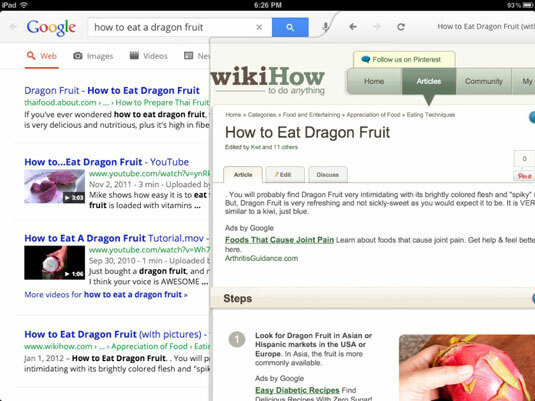 In addition, the iPad Google Search app enables you to see search results and websites side by side to quickly browse pages and results. Swipe left and right to easily switch between the two. You can search by voice as well as typing, compare search results as webpage snapshots in Instant Previews mode, use the Visual Search History to see past search results, and more.